OLYMPIA – This November, voters could choose between two measures that define rules for the use of deadly force by police. Or they could have one choice. Or no choice, because a new law might already cover that topic. 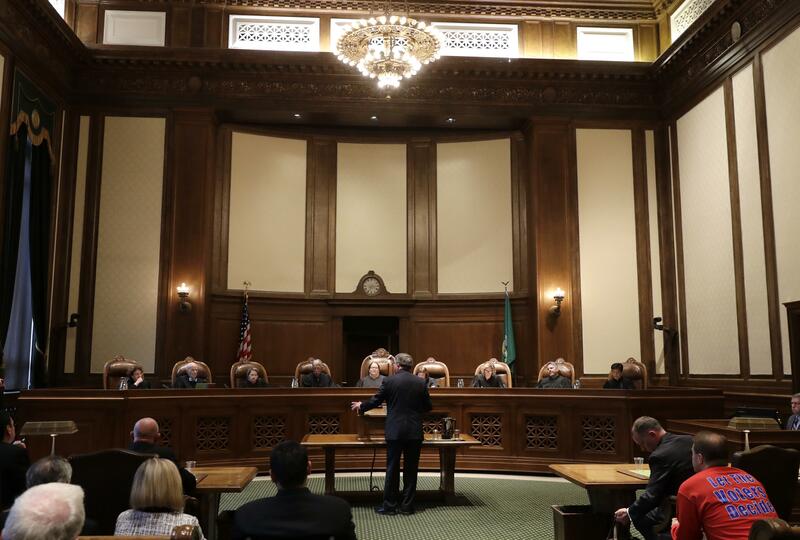 It depends on how the Washington state Supreme Court sorts through the complicated process – supporters call it novel, opponents call it unconstitutional – surrounding Initiative 940, which was submitted to the Legislature at the beginning of the year. The justices had some tough questions on that process for those who are proposing each option, ranging from parsing the state Constitution’s syntax to the authority to cobble together a ballot measure from two different sources. As written, I-940 would adopt new standards and require independent investigation when a law enforcement officer uses deadly force. Law enforcement groups and others objected to some aspects of the proposal, and lawmakers negotiated some changes between them and members of De-Escalate Washington, the initiative’s sponsors. Those negotiated changes were put into a separate bill, which passed on the final day of the session and immediately was signed by the governor before the Legislature voted to pass I-940. The bill has language that would have made it void if the initiative didn’t pass; but it did, so the bill was written to make the changes the day after the initiative became law. Critics, including Sen. Mike Padden, R-Spokane Valley, said that violates the state Constitution, which says if the Legislature votes to approve an initiative without amendment, it becomes law. If it rejects or ignores an initiative, the measure goes on the ballot. If it wants to amend the initiative, it can pass an alternative and both go on the ballot. A trial court ruled the initiative wasn’t properly passed by the Legislature so it should go on the November ballot, without the separate bill as an alternative. The Supreme Court is being asked for a final decision before the November ballot is set later this summer. Deputy Solicitor General Jeff Even described the process, which has never been tried before, as an “intersection of the legislative powers” of the people and the Legislature. One reading of the Constitution would allow for such a process, and the court should let the initiative, as amended by the bill, remain law. Fairhurst and several other justices weren’t convinced: “How much more explicit can it be than ‘without amendment’?” she asked. Greg Wong, an attorney for De-Escalate Washington, also agreed the law should stand as is, but if not “at a minimum I-940 should be declared valid” because the Legislature clearly voted to approve it. But Joel Ard, an attorney for perennial initiative sponsor Tim Eyman, said the Legislature only voted for I-940 because they knew it was going to change. “They amended first and adopted (I-940) later … the order that is expressly forbidden” by the Constitution. Both I-940 and the bill should go on the ballot for voters to choose, he said. But the bill isn’t a complete proposal, it’s merely changes to I-940, Justice Sheryl McCloud said. Would Secretary of State Kim Wyman, who has ultimate control of the state ballot, have the authority to rewrite it as an initiative? Even countered that Wyman couldn’t create a ballot alternative because the Legislature didn’t pass an alternative. That language is nowhere in the bill. “They have to call it an alternative?” Justice Debra Stephens asked. Published: June 28, 2018, 6:05 p.m. Updated: June 28, 2018, 10:57 p.m.